If you are interested in Prairie Green School, the first step is to come observe with or without your child(ren). You can set up a time that works for your family and with the Prairie Green schedule. 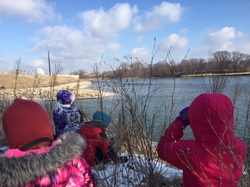 During the observation you will have an opportunity to see the space and witness Prairie Green students and teachers in action. Additionally, we invite your child(ren) to come and be student(s) for at least a day to further determine if Prairie Green School is a good fit for him/her. If your family feels it is, the next step is to complete an application for admission. The application has questions for both parents and children to enable us to have a better understanding of your family’s interest in Prairie Green School. We want to assure that collectively we will serve the purpose of following the school’s mission while also meeting your child’s educational goals. This interview process ensures a good fit from everyone’s perspective. The tuition for the 2015-2016 school year is $8000. Additional fees may apply for transportation.